When I was a small boy I once received an Eisenhower dollar as a gift from my Great-Uncle Gwyn. I’m not sure what Great-Uncle Gwyn did for a living, but he seemed to spend a great deal of time travelling. My grandmother would proudly display postcards from far flung exotic locations that she had received from him. Judging from the ten gallon hat that rarely left his head even during short family visits to wet and windy South Wales, the United States was one of his favourite destinations. Sadly, he died when I was still a boy, but I have fond memories of sitting with eyes as wide as saucers as he regaled us with fantastic tales of his travels, from rounding up cattle in Texas to being chased by alligators in Louisiana. For a while, the Eisenhower dollar was one of my favourite possessions. In the hands of an eight-year-old it is particularly large and satisfyingly heavy, and it brought me much needed kudos from my classmates when I brought it to school. Shortly afterwards, it disappeared without trace. I still look for it when I’m moving boxes around in my parents’ attic, but it hasn’t turned up yet. The 1972 Eisenhower Dollar is, according to my well-thumbed copy of “100 Greatest U.S Modern Coins” (Third Edition) one of the 100 greatest U.S modern coins. The guide actually ranks it at number 21. Astonishingly, its great numismatic appeal has little to do with the stunning design of an eagle landing on the surface of the moon that so impressed my former classmates, and more to do with the die problems that blighted the production of the copper-nickel circulating coin. 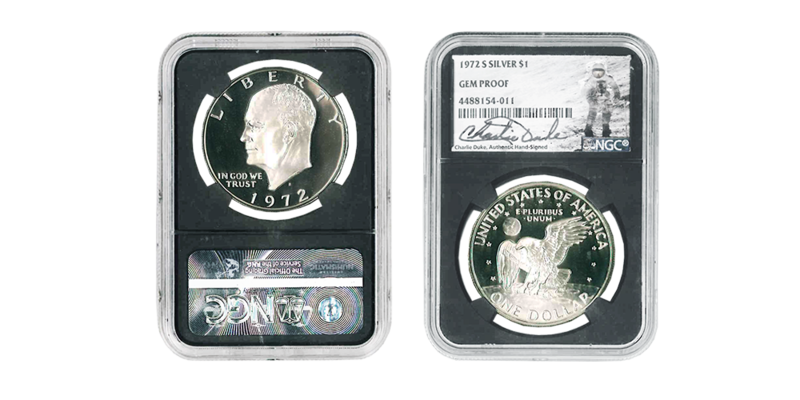 Chief Engraver of the United States Mint Frank Gasparro originally created his design in high relief, and this was used to strike proof quality commemoratives. However, a low-relief version of the design (Type 1) was used to strike the majority of the circulating coins. These were considered inferior and poorly detailed and so a second version (Type 2) was introduced, which attempted to replicate the superior high relief. However, Type 2 was found to be impractical for mass production, and was quickly replaced by a further modified variant (Type 3) which was used to strike the remainder of the coins. If you ever see a good quality circulating version of the 1972 copper-nickel Eisenhower Dollar, it is worth checking it to see which design has been used. The easiest way to do this is by examining the tiny details that appear on the earth above the eagle. Type 1 coins show the upper left of the earth curiously flattened. Type 2 coins show a round earth and no discernible islands under Florida. Type 3 coins also features a round earth and show small islands beneath Florida stretching out to the left and right. If spotting these miniscule variations sounds too much like hard work, it is probably worth mentioning that high quality examples of the circulating Type 2 coins can change hands for many thousands of dollars. This is information I wish I’d known when I was happily passing my Eisenhower dollar around the school playground. If you ever find one that makes you a fortune, you can thank me later. Fortunately for those of us with slightly less elasticated wallets, there is a much easier way to own this beautiful coin struck in the superior high relief as its designer originally intended. And that is to buy the proof quality fine silver commemorative version. The London Mint Office website is currently offering this very coin on its website authenticated as gem proof quality by the Numismatic Guaranty Corporation (NGC). 1972 was a very important year for NASA, as they made their final two manned trips to the moon; Apollo 16 in April and Apollo 17 in December. 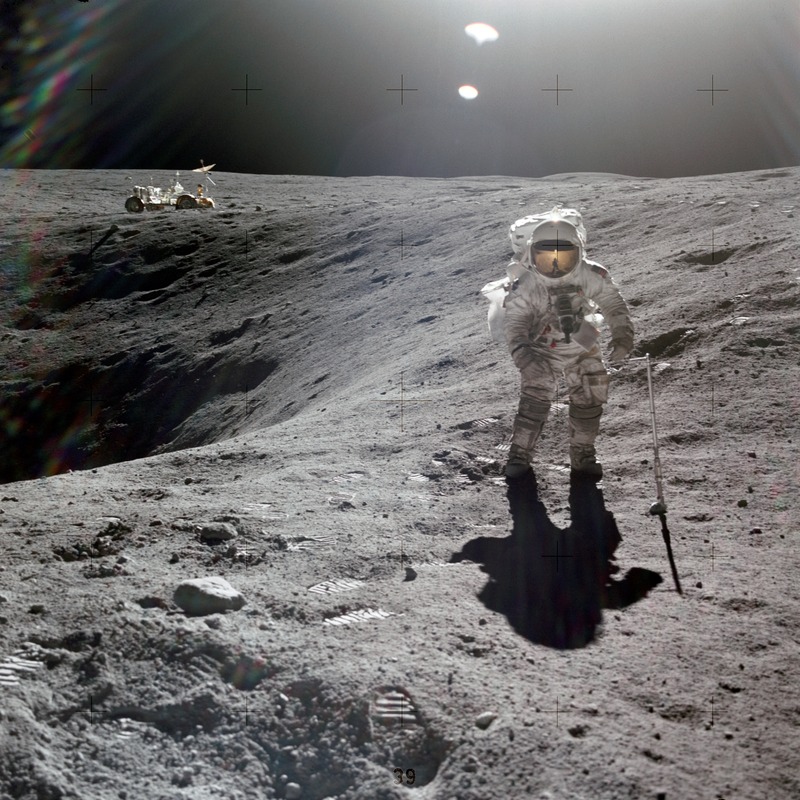 Only twelve human beings have ever walked on the surface of the moon, and one of the last to do so was Charles Duke, the pilot of the Apollo 16 mission. 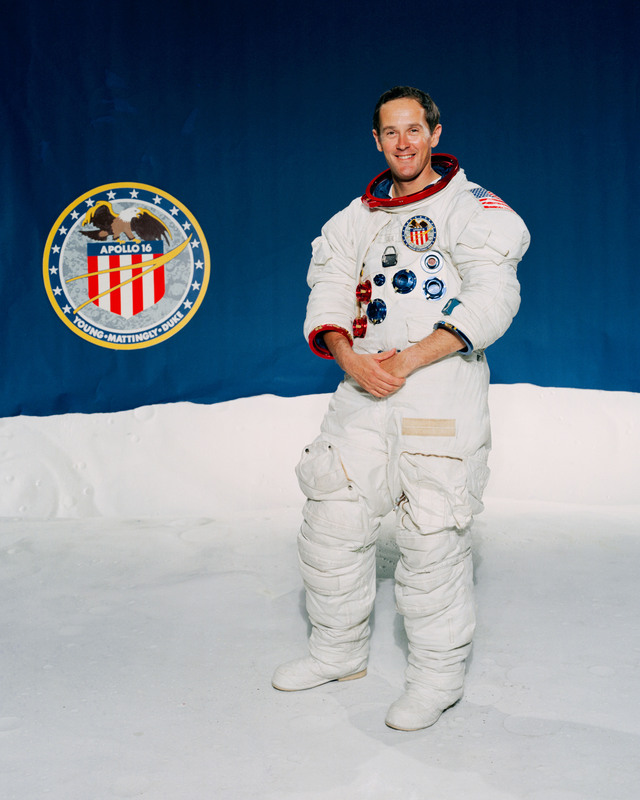 Aged 36 when he stepped out onto the lunar surface, Duke was, and still is the youngest moonwalker, and he has personally signed the authentication strip of the coin issued in the year of the Apollo 16 mission. As far as I’m concerned, a gem proof 1972 silver dollar featuring Frank Gasparro’s out-of-this-world moon design and encapsulated with the autograph of a man who actually went there that year is an absolutely perfect match. I’ve decided to buy one as an early Christmas present to myself, and raise a glass to my Great-Uncle Gwyn when it arrives. But I’m never going to stop searching my parents’ attic.